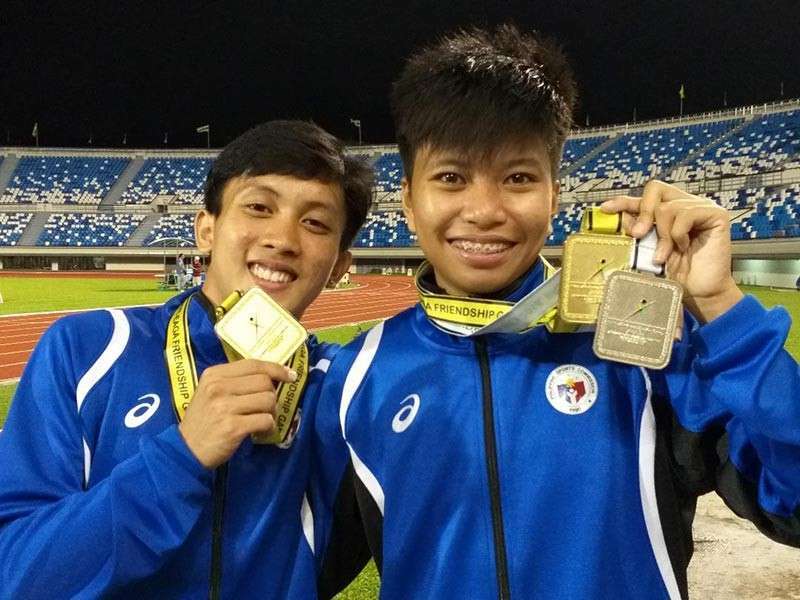 Brunei -- While Dabawenyos-bannered Mindanao suffered a medal shutout, Palawan's Jhon Lloyd Cabalo and Jessel Lumapas saved the day for Team Philippines by sweeping the men's and women's 400-meter golds, respectively, as the BIMPNT-Eaga Friendship Games 2018 athletics competition kicked off at the Hassanal Bolkiah National Sports Complex in Bandar Seri Begawan here Friday evening. Lumapas, 18, a Grade 12 Humanities student at National University, first pocketed the country's gold after clocking 57.47 seconds in women's 400 meters. She raced past Nurfadillah Mulyadi (1:00.71) of South Sulawesi and Puteri Nur Safirah Gajali (1:02.22) of Sabah who copped the silver and bronze, respectively. The golden feat came on the heels of taking a silver in women's 100-meter dash. She only had a three-minute rest before running the 400. “Mahina talaga labas ko nung sa 100. Yung sa 400, inuunti-unti ko nagpacing lang,” the 2018 Palarong Pambansa quadruple gold medalist and women's athletics most valuable player (MVP) said in an interview with SunStar Davao. She was also a silver medalist in the same event in the Asean Schools Games. Cabalo, meanwhile, secured the second gold in a come-from-behind fashion. He registered 50.14 seconds to defeat Sabah's Isaiah Ng Jian Lung (50.97) and South Sulawesi's Nurhidayat Yusuf (51.29). He was trailing bets from Northern Territory, Malaysia and Indonesia in the first 150 meters. “Binantayan ko ang Australia kasi sya ang second best time sa akin sa semifinals sa last 150 pero nag peak ako at nung last 80 naabutan ko na ang Malaysia at Indonesia sila kasi yung nangunguna at nung last 50 meters, nag full blast na ako,” he said in a separate interview. The 18-year-old, who is also an NU varsity scholar like Lumapas, said, he can't thank God enough for the blessings he has been receiving. Standing at five-foot-three, Cabalo was the smallest runner among eight finalists, yet, he stood out and surprised them and the rest of the spectators. He dedicated his gold to mother Imelda who single-handedly raised him through dressmaking in Palawan. “First time kong maglaro sa ibang bansa at gusto kong magbigay ng karangalan sa Mama ko at sa Pilipinas,” Cabalo added. 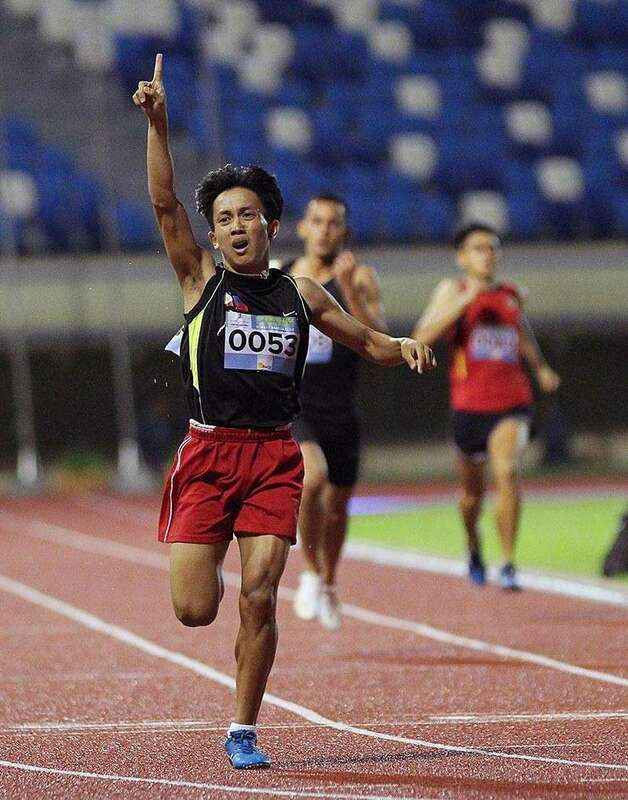 Palawan also annexed a silver and bronze in men's 1,500m for Palawan's 2-2-2 total medal haul Friday.